Everyone readily admits that Uzeyir Hajibeyov (pronounced oo-zeh-YEER hah-jee-BEY-ov) was a genius. If you ask the reason why, some would say it was his pioneering spirit - his ability to forge paths where no one had ever trod before. Left: Last photo of Uzeyir Hajibeyov in 1948. And some would point specifically to his first major work, "Leyli and Majnun" (1908), which was the first opera not only in Azerbaijan but also in the entire Muslim world. Others would credit his vision in synthesizing eastern traditional elements (melody, mode and instruments) with western style and form (for example, symphony andm opera). Or they would applaud his foresight in insisting that Azeri folk music could and should, indeed, be transcribed via European musical notation. Written scores, in turn, helped to establish the legitimacy and continuity of our own folk music. Some would single out his pedagogical and administrative talents that led to the creation of numerous fundamental institutions such as a composer's school, a folk instrument ensemble and other educational forums which still exist today. Others would admire his ability to walk the tight line between his own independent spirit and one highly controlled by a dictatorial authorities. 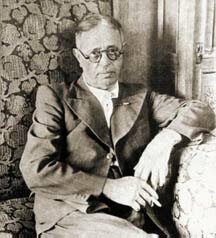 Despite these enormous achievements, in my opinion, Hajibeyov's true genius lay in the fact that he was the person most responsible for inviting the great musical minds to come to Azerbaijan, especially between the years of 1920-1940. Hajibeyov brought the brains to Azerbaijan. And this simple act enabled our nation to make incredible leaps in the development of our music. Such a leap had never occurred in any other single country - both in terms of quality and quantity. I have visited numerous countries, attended many festivals and met many of the world's great musicians, and they're always amazed to discover the high caliber of Azerbaijan's music. To me, this is the greatest legacy of Hajibeyov. This was the true nature of his genius. Stalin, himself, attended the performance of Hajibeyov's opera "Koroglu" in Moscow (1938) and afterwards personally congratulated him, telling him to write "two couples more (meaning four)." Hajibeyov was awarded the Stalin Medal twice in his lifetime and, under the personal instruction of Stalin, was directly admitted into the Communist Party without being a candidate for membership - an extremely rare exception. Yet, still the composer lived in constant danger of being discredited as an "Enemy of the System."